Other small cars, step aside. 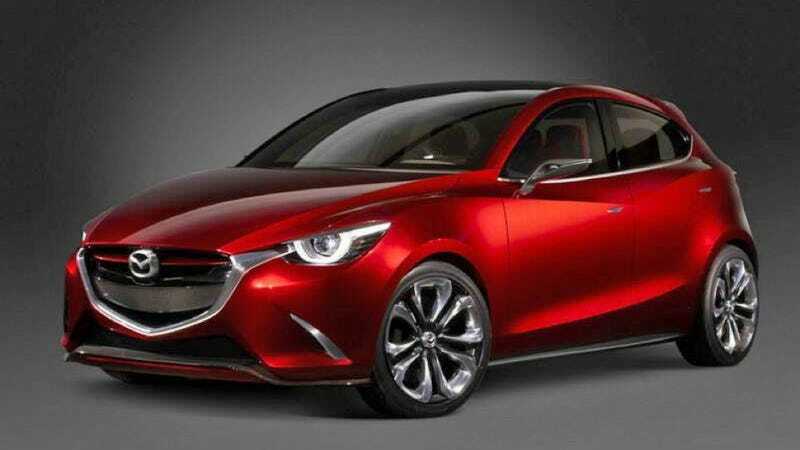 The Mazda Hazumi Concept is the next Mazda2. And holy crap, this thing is gorgeous. Why would you buy anything else? The little Mazda2 is one of our favorite small cars. It's just a barrel of fun to drive and wring out in the twisties. Plus, no matter how fast you try and drive it, it's rare you're breaking a speed limit. It's a hoot. But it looks kinda blah blah blah. That's all changing with the Hazumi (we found these pics thanks to Chris Doane Automotive), which is far better looking than pretty much any car in its segment. It's aggressive and taut, kind of Alfa-y... though that makes sense since Mazda is working with Alfa on the next Miata. Sure, a lot of this is just for the concept car. Expect that interior to be toned down and the wheels to shrink, but the essence of the next Mazda2 is right here. Those center exit exhausts, the athletic front fascia, the tall yet wide rear end. It all comes together to make what I think is going to be the best looking hatch in the wee little b-segment. And now that the Mazda6, Mazda3, and the Mazda2 have received a non-smiling facelift, that leaves one car that needs to change: The Miata. If it looks half as good as this, it'll be a home run. Seriously, why doesn't everyone just always buy Mazdas? Forget everything else.